The GR series offer an economical solution to larger growing area requirements. With ceiling mounted air distribution systems, these rooms do not require an insulated floor, so that per square foot costs can be minimized. Convenience features include center isle configuration, adjustable counterweighted light canopies, microprocessor control, and single point service connections. 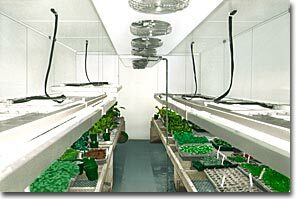 GR rooms can also be outfitted with a variety of plant carts or benches, high intensity lighting, and control options. GR series growth rooms come in standard sizes from 48 ft2 to 192 ft2. Special size walk-in rooms can be designed to meet your particular requirements. Options - GR rooms can be custom configured to meet your needs. Contact us with your specs. Growing Height 80" 80" 80" 80" 80" 80"
Interior Dimensions 9'0" x 10'11" 10'11" x 10'11" 9'0" x 16'8" 10'11" x 16'8" 9'0" x 24'4" 10'11" x 24'4"
Overall Height 102" 102" 102" 102" 102" 102"
*Specifications subject to change; overall dimensions may vary depending on optional equipment.